Dr. Esther Solomon, a reputed scholar and teacher of Sanskrit and Indian Philosophy has made major contribution to Indian Philosophy through her works on Samkhya, Nyaya, Jain and Vedanta systems of Indian Thought. She began her teaching career in Sanskrit from 1949. She was Head of Sanskrit department at the Gujarat University from 1964 to 1987. She received the Presidential certificate of Honor for outstanding contribution to Sanskrit in 1983, followed by Padmasri award in 1992. Dr. Shuchita Mehta is currently serving as the Head of Sanskrit debarment at St. Xavier’s college, Ahmedabad. She has presented research papers at many national as well as international academic conferences. She has also published articles in reputed journals. She has authored a book, titled – ‘Idealistic thought in Indian Philosophy’, which depicts the full fledged development of Drsti-srsti-vada. Shuchita Mehta’s editorial work on Jayarasi Bhatta’s ‘Tattvopaplavsimha’ has been a labor of love, as former doctoral student of Dr. Esther Solomon. Jayarasi Bhatta’s ‘Tattvopaplavasimha’ is a rare piece of work on Indian Skepticism. Its author has boldly criticized the means of valid knowledge affirmed by the various systems of Indian thought, namely Carvaka, Nyaya, Samkhya, Mimamsa, Vedanta, Buddhist and Jain respectively by declaring the annihilation of all the principles. Although the tradition links it with the Carvaka system of thought, its study leads a reader toward a skeptical critique of all the major systems of Indian Philosophy. It is indeed a unique work depicting Jayarasi Bhatta as a great dialectician. The First Sanskrit edition of this book was prepared by late/ Pt. Sukhalalaji and Sri Rasikalala Parikha which was published by G.O.S. in 1940. Translation of this book in to English was the project undertaken by Prof. Esther Solomon, which is being introduced as her last monuments. "There is nothing pure like knowledge here." - [Srimad Bhagavad Gita, ch-4-38 ab]. I found Prof. Esther Solomon as a personification of these words of the Gita. It is very difficult for me to find suitable words to write about Prof. Solomon's scholarship. Her works, namely, 'Indian Dialectics', 'Avidya-A problem of Truth and Reality', 'Samkhyavrtti', 'Samkhyasaptativrtti', 'The commentaries of the Samkhyakarika-a study' offer a testimony of her sharp acumen, deep maturity and strong grip on the subjects that she has dealt with. Before her demise in June 2005, Prof. Solomon had completed translating Jayarasi Bhatta's 'Tattopaplavasimha' using the Sanskrit text edited by Pandita Sukhalalaji and Sri Rasiklala Parikh published by G.O.S. in 1940. She had also consulted Eli Franco's revised text. It gives me immense pleasure to have the responsibility of final editing and introducing this last monumental work of Prof. Solomon on 'Tattvopaplavsimha', a rare piece of work on Indian Skepticism, her unforgettable contribution. I have thoroughly enjoyed working on this project and have benefited from putting together this valuable translation of this rare gem of Indian Philosophy's pluralistic richness. I would like to thank Sri Aviv Divekar, the nephew of late Prof. Solomon, who gave me all the assistance and encouraged to prepare this manuscipt for publication. At the same time I want to thank the scholars, whose books I have consulted. In particular, I have benefited from the Sanskrit edition of Pandita Sukhalalaji and Sri Rasiklala Parikh, and from the thesis of Prof. Eli Franco [Leipzig University, Austria]. It must be noted that Prof Solomon has mentioned about the different text, particularly the one, reedited by Eli Franco. At the same time I would like to thank Prof. R. Raj. Singh [Brock University, Canada], Prof Kazuyuki Funatsus [Shinshu university, Japan], and Prof. Vijay Pandya [Retd. Prof. Gujarat University, Ahmedabad] for encouraging me throughout my endeavor . The most perplexing riddle directing a curious mind towards philosophic speculations is the world around us. Whatever we perceive is not permanent by its nature. We do experience change that compels us to think about the very nature of things. But then a question arises: can the knowledge of Truth be obtained? Is it possible to have right knowledge? One could say that philosophizing is a process that beings with what is ‘seen’ and ‘experienced’. But that does not necessarily mean that philosophizing leads to a definite conclusion. It is worth noting that most of the systems of Indian Thought portray the journey of their philosophic speculations initiate from the ‘seen’ and conclude with the ‘unseen’.... From very ancient times it has been the persistent endeavor of the human psyche to arrive at some possible conclusion so far as the knowledge of ‘Truth’ is concerned otherwise known as Darsana or philosophy. At the same time it must be noted that right from Vedic times there was a tendency of expressing doubt about the true nature of the world around us. The hymns of the first and the tenth Mandalas revealed by Visvekarma, Paramesthin and Dirghatamas respectively especially declare the tendency of doubting whether Truth can be known or not. It would not be out of place to examine these hymns. In 164th Sukta of the first Mandala, Dirghatamas inquires "I ask, unknowing, those who know, the sages, as one all ignorant for sake of knowledge, what was that one who in the Unborn’s image hath established and fixed firm these world’s six regions.”1 Here we find the terms indicating the tendency of doubting the revelation of knowledge. Further on, the tenth Mandala also exhibits the same tendency by applying the term: Niharena Pravrtah. It states, "Ye will not find him, who produced these creatures: another thing hath risen up among you. Enwrapt in misty cloud, with lips that stammer, hymn chanters wander and are discontended. "2 Moving along the same track, Sukta 129 of 10th Mandala show the specific development of such a tendency. Hymns sixth and seventh respectively can be said to have some specific development that can lead us towards skepticism? "Who verily knows and who can here declare it, whether it was born and whence comes this creation? The Gods are later than this world’s production who knows then whence it first came into being?" Moreover, "He, the first origin of this creation, whether he formed it all or did not form it, whose eye controls this world in highest heaven, he verily knows it, or perhaps he knows not. "2 We may consider these two hymns as landmarks in the history of Indian Skepticism. Here it would be pertinent to note that as per ‘The New Encyclopedia Britannica’, evidence of skeptical thought appears earlier in non western philosophy than in the western philosophy, in particular in the Upanisads.3 But we say that even earlier than in the Upanisadic era we get specific glimpses of skepticism in the above mentioned hymns of the Rgveda. Apart from the Vedic hymns we get the skeptic tendency carried on further during early Buddhism. While not going in to its details at this juncture, we would like to mention that some of the systems of Indian thought certainly find difficulty in giving expression to the Truth. 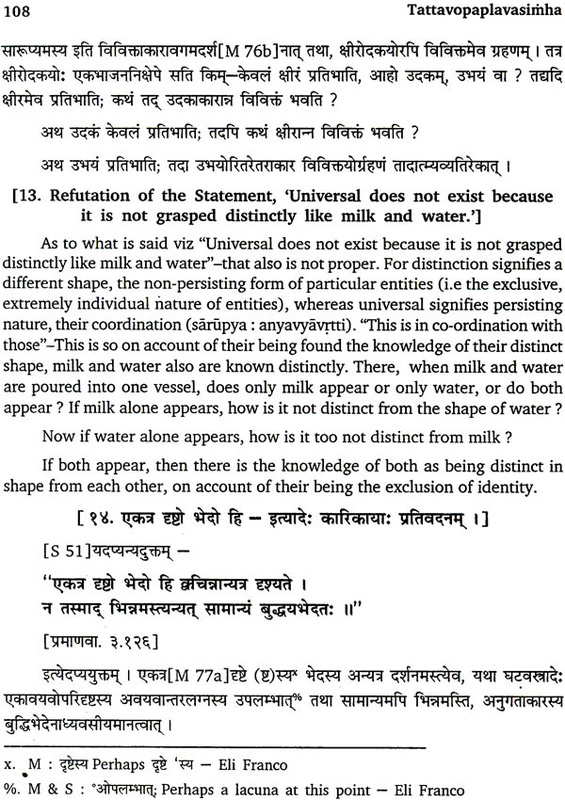 In ‘Khandanaldiandald1adyam’, SriHarsa has mentioned about the Cavaka, Vedanta and Madhyamika thoughts as having the skeptic standpoint related to the nature of Truth.4 Apart from some stray references we do not have any development of Skepticism. Hence it may be assumed that Indian thought lacks the history of Skepticism. To counter this we have Jayarasi Bhatta’s Tattvopaplavasimha, a rare and unparallel work depicting the full- fledged form of Indian Skepticism. Tattvopaplavasimha is a unique work in itself that evaluates, criticizes and demolishes all the testimonials of valid knowledge emphasized by the systems of Indian Thought. Hence the contribution of Jayarasi Bhatta is unforgettable. It is indeed unfortunate that not much work has been done in the area of Skepticism that is highlighted by Jayarasi Bhatta. The Source book that contains some details about Jayarasi is the Sanskrit edition prepared by Pandit Sukhlalji and Shri Rasiklal Parikh. On the basis of their research we can summarize some details about the date and native place of Jayarasi. According to some external and internal evidences, Jayarasi can be said to have flourished between 7** and 8** century A.D.1 The most noteworthy point about the external evidence is that, Jayarasi view of ‘Tattvopaplava’ and its holders are referred to as ‘Tattvopaplavavadins’ by some noteworthy Jain Logicians, namely, Anantavirya and Vidyanandin in the ninth century, A.D.2 This clearly indicates that Jayarasi might have lived before ninth century. We get some helpful link from the internal evidences too. The study of the work certainly guides us to the date of the author. It would be interesting to note that Jayarasi has not mentioned the name of the exponents of the systems that he has criticized, except that of Brhaspati. Even Sankara’s name has not been mentioned. This might have encouraged scholars to date him before Sankara, or as his contemporary. It can be said that it might not have been a tradition at that time to refer to any system of Thought by the name of its ‘Acayas’ or exponent. Another sure platform is the number of the testimonials affirmed by the orthodox as well as by the heterodox systems of Indian Thought which are severely criticized and refuted by Jayarasi. From this we may say that Jayarasi lived during the period when six testimonials were famous and accordingly accepted by the respective systems of Thought. This leads one to consider Jayarasi to have been lived between 7th and 8th century, A.D.
Now, as far as the native place of Jayarasi is concerned, from more or less the same evidence it has been stated that he belonged to South India. One can see that Jain Acaryas, who flourished in the South, namely, Anantavirya and Vidyanandin etc, have criticized Tattvopaplavavada of Jayarasi. Apart from them, we do not get any references related to his view. This leads us to consider South India as his native place. Another point of inquiry that is very commonly carried out by scholars is related to personal information about the author of any field of knowledge...Jayarasi was not an exception. Was Jayarasi a Jain or a Brahmin? Common sense tells us that he was not a Jain. He has refuted the epistemology affirmed by the Jain system and vice versa, which confirms him as non Jain. On other hand the term ‘Bhatta’ is traditionally associated with Brahimns. Moreover, the reverence rendered to Brhaspati, the perceptions of Gods indicates that he might have been a Brahmin. We can say that it is immaterial whether he was a Jain or a Brahmin. What matters is his sharp acumen evident in his work, his revolutionary attempt to criticize the testimonials approved by the orthodox as well as the heterodox systems of Indian thought, and his boldness to stand alone like a lion by refuting them all. Let us begin with an analysis of the title Tattvopaplavasimha. We can say that the title itself indicates its unique place in the field of revolutionary philosophic speculation. There are three terms that construct the title namely, ‘Tattva’, ‘Upaplava’ and ‘Simha’. It implies "The Lion, annihilating or upsetting the ‘Tattva’ or Principles? Here the various systems of Thought with regard to ‘Tattva’ i.e. matter or the very core of oneself—[the term varies within each system of Indian thought.] It would not be out of place of mention that one is able to obtain knowledge with the help of various testimonials. We perceive the world around us as a combination of matter, — earth, water, light and air. These we grasp with the help of perception, which is the most applicable means of knowledge. Inference also helps us to gain knowledge. In short, Perception [Pratyaksa], Inference [Anumana], Analogy [Upamana], Verbal testimony [Sabda], Inclusion [Sambhava], and Tradition [Aitihya] etc are various means which enable us to gain knowledge. It would not be out of place to mention that here only six means have been mentioned which Jayarasi has refuted. Of course, each system of Indian Thought has approved the validity of these means of knowledge according to its own perspective. But a doubt may arise: one able to know reality or ‘tattva’? Can we grasp reality as it is? Our systems of Thought have opined positively as well as negatively. It would not be out of place to reiterate that SriHarsa has noted about the Carvaka, Vedanta and Madhyamika systems of thought which have expressed their views rather negatively. We must note that the Carvakas hold perception as the only valid means of knowledge. But there might be some other branch which has condemned even perception as the only valid means of knowledge" Sankara emphasizes Brahman as inexplicable, and the Madhyamika branch of Buddhism also opines the same by emphasizing ‘Sunyata’ i.e. voidness. In short, a skeptic tendency was already prevalent among some thinkers regarding the attainment of true knowledge. It is indeed regrettable that we do not have the systematic history of the development of such a speculation. Tattvopaplavasimha is the only specimen depicting full fledged development in this direction. Of course, it is rather very difficult to evaluate it either as emphasizing skepticism or vitanda as a part of Dialectics. According to its Sanskrit edition, we find Tattvopaplavasimha divided into fourteen sections dealing with the annihilation of various testimonials affirmed by the various systems of Thought. It opens with the statement of resolve to compose the Text. 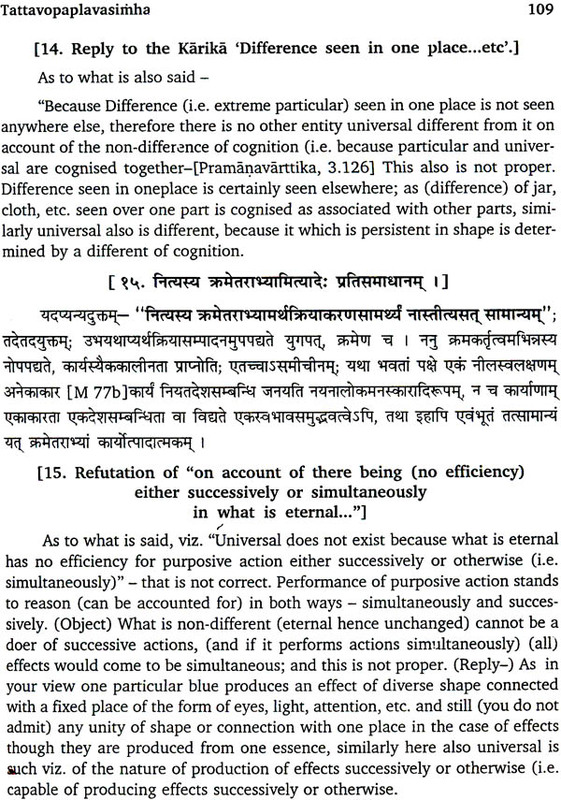 It is interesting that Jayarasi considers this task rather difficult.2 As some part of the text is missing we can not state with certitude, but it seems that he initiates his thesis by mentioning a very basic speculation which condemns everything that is beyond the grasp of perception.3 Hence there cannot be any fruit of action such as heaven. He clarifies the intention behind such a statement that one should follow the common practice, because the simple and learned are similar. After the statement of resolve, he mentions about the view of Brhaspati, who holds the validity of four elements grasped by perception. Jayarasi confirms that he has refuted this. Moving along the same line he refutes the characteristic of perception approved by the Nyaya system. Eventually he condemns genus i.e. ‘Jati’ and inherence i.e. ‘Samavaya’ affirmed by the same system. In other chapters he has dealt with the other systems namely Buddhist, Jain, Mimamsa and Samkhya respectively by criticizing and refuting their stand of Perceptin. Further on, he has examined the definition of testimonial. i.e. ‘Pramana’ as emphasized by Mimamsa and the Jain systems. 3. Examination of the Buddhist definition of a source of valid knowledge. 8. Refutation of the inference of soul. 14. Refutation of the means of proof “word”.